Before I had heard that this dog had been lost, before I’d heard that his owner was lost without him, I felt a pang myself. That’s the power of an image—or more accurately, the power of an emotion. My sister had sent me this photo, telling me that it was a picture of Harry, her friend’s dog that had gone missing that morning. But I didn’t even get to that point in Harry’s sad story before I felt my own loss. What looking at the picture did was take me immediately to a memory, one I hadn’t thought of in years, of a German Shepherd that my family had brought home from the pound when I was eight or nine. I think my brother and I were supposed to share responsibility for the dog, but I do remember that I was in the lead in begging to have a dog. 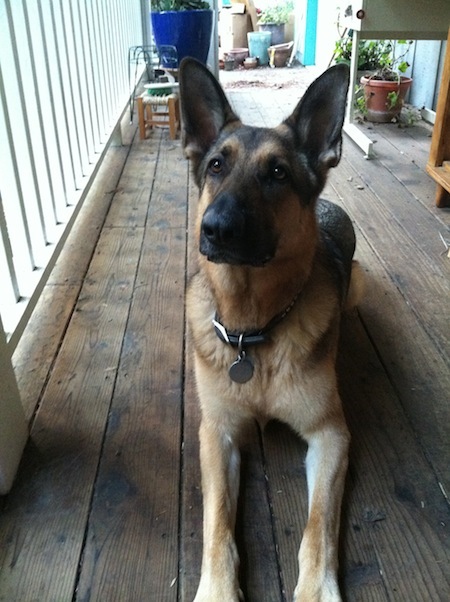 Our dog, Champ, was a beautiful shepherd like Harry, and he was friendly and fun, but he had a “flaw”: he could easily jump over the five-foot fence that bound our yard, and he did it regularly. We had to hunt him down, all in a frenzy, over and over. I don’t recall how deep the discussion and if many other solutions were offered, but my dad decided, perhaps only after a month or so, to return Champ to the pound. I was crushed. I remember driving to the pound with the dog in the back of the station wagon, hating my dad at the wheel, my face burning. It’s strange to still have the salt active in a wound from so long ago, and stranger still the mix of emotions, because it makes me miss my dad, who died a couple of years back. But this post isn’t exactly about dogs, nor about losses, as an adult or a child. More so that some emotional grounds, though they might be covered, are never actually buried. People’s emotions can jump from their bodies without any chance for their cerebral side to intervene. And that’s where we as writers, whether of business or essay or tale, should open a gate. Not as manipulators of emotion, but encouragers of it. Post the pictures in readers’ minds of lost dogs, stern parents, the gleam of future dreams. No matter if you are writing about email marketing programs or the electricity of your first kiss, try to open the gate so the emotion comes through. (Now you might grant me the kiss part, but email marketing? Believe it, there’s a charge and a current in everything—you just have to plug it in.) So yes, the Internet has changed the game—at least on this side of the digital divide—but before the first packet, before the first link, before the first tweet, there was the human heart. It leaps. Oh, by the way: Harry? Harry made it home. Good dog! I had a post at Firepole Marketing a short while back that runs its fingers through a few of the things discussed here. Check it out: Flesh and Blood, Meet Flesh and Blood.